DALLAS, March 26, 2018 /PRNewswire/ -- Lockheed Martin (NYSE: LMT) and Cypress Creek Renewables have commissioned 12 MWh of GridStar™ Lithium energy storage systems for 12 solar-plus-storage projects. The solar-plus-storage system will provide clean electricity to communities served by Brunswick Electric Membership Corporation (EMC) in southeastern North Carolina. 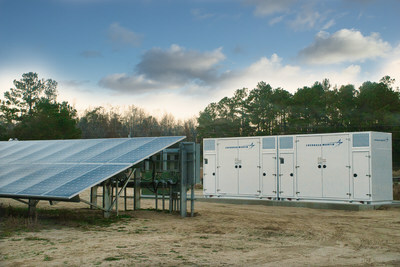 Shown here is one of Cypress Creek’s 12 solar-plus-storage installations in North Carolina. The projects will provide 12 MWh of Lockheed Martin GridStar™ Lithium energy storage. Lockheed Martin's GridStar™ technology ensures that this power is rapidly dispatchable — a key benefit that allows Brunswick EMC to avoid peaking costs and pass the savings to its member-owners in Brunswick and Columbus Counties, as well as small areas of Robeson and Bladen Counties. "These projects provide solar energy to our members and compound the value by delivering it exactly when we need it," said Don Hughes, CEO/general manager of Brunswick EMC. "This collaboration will provide significant value to our members for years to come." "We are approaching a point where many newly originated solar projects will become solar-plus-storage by default," said Brian Knowles, director of energy storage, Cypress Creek Renewables. "Cypress Creek Renewables is proud to collaborate with Lockheed Martin and URE to provide Brunswick EMC with a dynamic solar product that is able to respond to changing conditions on the grid or in energy markets." Roger Flanagan, director for Lockheed Martin Energy, added, "We are pleased to support Cypress Creek Renewables' innovative solar-plus-storage projects. Energy storage is key to unlocking the true potential of renewable energy generation." Lockheed Martin's GridStar™ Lithium energy storage systems are compact, easy to install, and scalable for 100 kW to multi-MW projects. GridStar™ system architecture consists of modular, purpose-built energy storage units that contain batteries, local controls software and all required balance-of-system components. The systems are certified to UL 9540 standards, a key certification for product safety for energy storage systems and equipment. Cypress Creek believes solar energy makes the world safer, cleaner and better. Our team solves problems to successfully develop, build and operate solar facilities across the United States. With 2.2. gigawatts of solar energy deployed in more than a dozen states, Cypress Creek Renewables is one of the country's leading solar energy companies. For more information about Cypress Creek Renewables, visit http://www.ccrenew.com. Brunswick EMC is the second largest electric co-op in NC, the 36th largest of nearly 900 co-ops in the U.S. and serves more than 94,000 locations in Brunswick and Columbus counties, plus small areas of Bladen and Robeson counties. Locally owned, the not-for-profit corporation is committed to providing safe, reliable and affordable electricity to its members. Established in 1939, the co-op has a longstanding tradition of working to improve the quality of life in the communities it serves. For more information about Brunswick EMC, visit http://www.bemc.org.